This is the World of Warcraft version. People travel for different reasons, so here are six locations that might appeal to a broad range of virtual tourists. They will be posted in a series of six parts. Cities and settlements are very important, not just to trading and resting, but also to virtual public life. They are like little subdivisions in the landscape where completely different activities take place compared to the rest of the world, and this is reflected in the design. People gather around in these places, show off their sparkly treasures they acquired when out fighting for greater causes, they idle, they hang out, they do business and socialize. A city break can both include shopping and cultural experiences – Dalaran offers both. Dalaran is a floating city suspended in mid air, located in Crystalsong Forest in Northrend. It was originally located in Alterac Mountains, where it was the center for the study of arcane magics and home to many wizards and mages, together forming the faction known as Kirin Tor. Within living memory their beautiful city was destroyed by evil forces during the Second War and they raised a magic dome protecting the city while it was rebuilt. 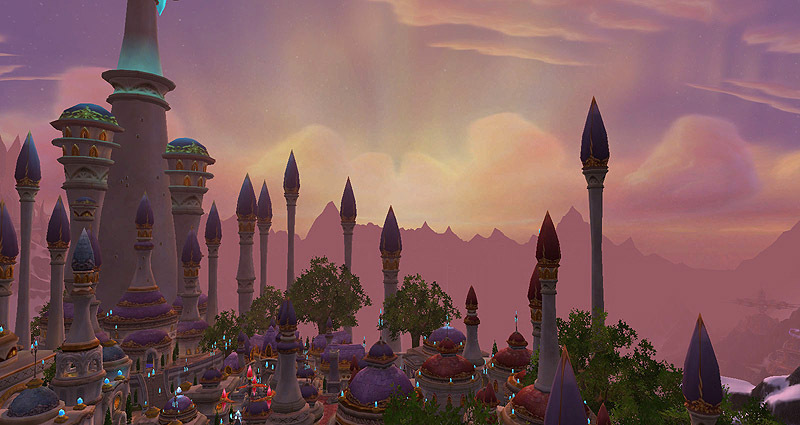 During original WoW, players were unable to visit Dalaran, as it appeared hidden behind an impenetrable pink dome. The second expansion to come (Wrath of the Lich King) featured the Kirin Tor having moved the city to hover above Crystalsong Forest, declaring itself a neutral city embracing both Horde and Alliance in cooperation to aid the fight in Northrend. Everyone was now able to get inside what was previously locked away from the public and back in Alterac Mountains, you could then find the remaining deep crater from when the city was literally pulled up by its roots. Like the capital cities of yore, population density can vary strongly and shift over time, and this city is a good example to have been through such as an ebb and flow phase. 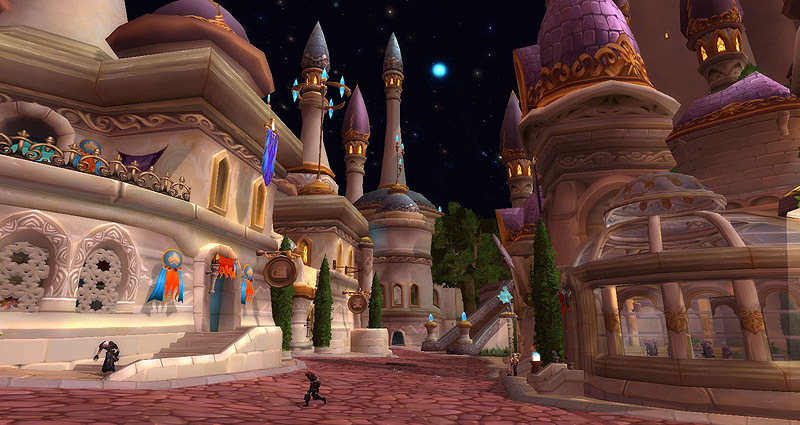 Dalaran was the absolute hotspot for players during the Wrath of the Lich King expansion. It has some historical value both lore-wise, as described, but also historically within the lifespan of WoW, as everyone was gathered here for years, until the big bad guy of that expansion, the Lich King, was defeated. Dalaran is worthy of a visit because of this history, but also because of its beauty and various shops, such as the gnome toy store. Also worthy of a visit is Karandonna, a skilled clothier, who will sell you expensive but very high quality martial shirts and filigreed doublets, garments which you can’t find anywhere else but here. Today the city is a lot more quiet than a few years back, but nonetheless you’ll still find people around. If you are interested in the absolute busiest of cities currently, you’ll find that they are not located on neutral ground such as Dalaran. If you belong to the Alliance, consider traveling to Stormwind. If you fight under the banner of the Horde, travel to Orgrimmar. This fact is a good indicator of how much conflict there is between the two factions, and right now the relationship between Horde and Alliance is more tense than ever. Bonus explorer information: Underneath the city itself, the sewers are situated, the so called “Underbelly“. By following the pipes down, you can find the underground population of Dalaran, the slums that always pop up in larger cities, the shady dealers, the fight clubs and giant sewer rats. I am a WoW blogger and recent game analysis graduate. Second part of my WoW Tourist Guide posted. It’s another one of those posts where the article grows and grows further than what I originally intended. I can’t contain myself, I can’t write short posts, I really need to become better at that. Glorious location, atmosphere, & architecture. When you say the Alliance / Horde relationship is more tense than ever — what’s up with that? The short version: A change in leadership means that now when you travel across the land, there’s war everywhere, everyone is fighting (NPC’s). There has always been a war, but it has intensified and rumor says it will only become worse in the next expansion in a few months time. Oh! I forgot to mention that Ms. Pennyroyal is the ONLY one of us that has managed to fish up the Giant Sewer Rat from the Underbelly sewers haha. But we both got all 3 of the Coins in the Fountain achievements! um well yeah! Everybody wants one ya know, right Ironyca? so… SaveMe Oh plays WoW now? Oh yes, especially if one is a pet collector. Ohhh all the pink, it hurts! Great article and I sooo recognize what you said about getting carried away while writing. It’s so hard to keep things short – I always fail at that myself. I didn’t think this one was too long at all, though, it was perfect for me. Do you have pictures of the sewers as well? It makes me curious what they look like, especially in contrast to the marvelous city above. I guess players preferred to hang out in the nice parts, just like they’d do in real life. The sewers are actually visually very interesting AND you will never see cleaner water in any sewer anywhere lol. It is like Waterford crystal 😀 Excellent fishing too! Hehe, Dalaran actually isn’t overly pinkish, the first picture may make it seem that way, but it’s because I took it early one morning (or should I say late one night) at sunrise. But I have a guess as to why it’s designed using those colors. As I described in the post, it’s the central place for the study of arcane magic, so I think the color scheme is based on the colors of arcane magic, which are pink, purple, blue and white. I edited in a picture from the sewers, the main chamber. It was already uploaded because I originally intended to include it, but desperately tried to limit myself. I did figure that leaving the picture out might make the article talk about something without showing it, and showing it was after all the point to begin with, so I put it back in. Perfect choice! A lot of my characters still set Dalaran as home and lately it seems more and more people are doing the same. Hey Tome, thanks for dropping by! And WoW! Your blog is awesome! Fireworks then and now is so sweet; Transmogolympics is amazing! Thank you! And I’m really enjoying the tour! I hope you scrolled far enough down, Tome is an excellent photoshopper! The character Ironyca, who was my main when I started blogging, lives in Dalaran too. Perfect place for retired characters. SLURLS GURLS .. so we can go visit. If by “SLURL” you mean Second Life Url, then I have to disappoint you, this article is about World of Warcraft (WoW) not Second Life. wut? there’s a world beyond Second Life??? You’re totally just making that up, aren’t you!? Sadly I don’t think our soft SL avatar skin would last long in the harsh environments of WoW, so you may just want to enjoy the scenery as Ironyca presents it. Of course Moni regularly does both WoW & SL, so it is possible!